The year is 1943. A five year old boy wakes up. He cannot stand or hold an apple in his hand. The boy is rushed to his family doctor, diagnosed with polio, and taken from his mother’s arms to the contagion ward at the county hospital. Thus begins his eleven year journey of surgeries, rehabilitation, and therapy so that one day, he can walk, unaided, across a stage and receive his high school diploma. While the boy struggles through his childhood, and in spite decades of research, polio epidemics continue to paralyze and kill hundreds of thousands of adults and children well into the late 1950’s. Polio and Me provides the heartbreaking story of polio’s devastating past, the struggle to overcome present, and promising future. There is many things I want to say about this memoir. I learned so much. I love a book which has me doing research. This book had me on Google through most of it! I cannot imagine going through what this author went through. How far we have come with healthcare. When he is taken away at 5 years of age from his parents…no hospital would dream of doing that now. And the disability access he could not have at school….amazing how things have changed. Being a pharmacist, I enjoyed the science part of this book. The developing of the vaccine was of great interest to me. I vaguely remember studying this in school. It was fascinating to learn all the many obstacles and problems related to finding a vaccine. And how fortunate we are, these scientists went to all this trouble. Sometimes the author repeats himself. This repetition can get a little confusing, especially if you are reading on a ereader…you think you accidentally paged turned. But, this is a compelling read with many wonderful aspects. Kudos to the author for all he went through and overcame! He is married to his childhood sweetheart and is a father of three, a grandfather of four, and great-grandfather of nine. After a successful thirty-eight year management career with Pacific Telephone Company, Ken retired to write golf and travel articles for Golf Digest, Golf Illustrated, Fairways and Greens, and Golf.com. During two NBC-TV Celebrity Golf Tournaments at Lake Tahoe, he interviewed Olympic Decathlon Champion, Bruce Jenner when he was Bruce, not Caitlyn, the mischievous Chicago Bears quarterback, Jim McMahon, the iconic Vice-President Dan Quail, and NBC Today show anchor, Matt Lauer. Ken designed, built, and operated a 2000 case winery named Pommeraie Vineyards where he produced award winning Cabernet Sauvignon and Chardonnay. He has published six mystery novels, The Bloody Birthright, The Big Showstopper, Death is a Cabernet, The Tartan Shroud, Brother Can You Spare A Dime, and The Unsavory Critic. 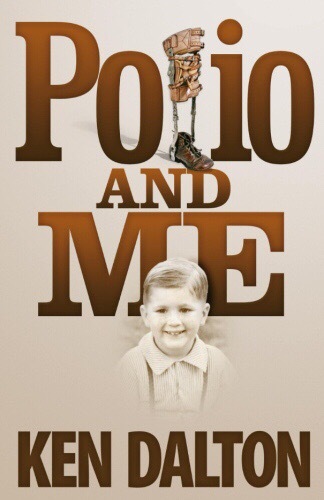 Ken’s memoir, Polio and Me, marks his initial foray into the world of non-fiction. Presently, Ken is working on his seventh Pinky and Bear mystery, The Heretic’s Hymnal. This entry was posted in Reviews and tagged kindle, non fiction, reviews. Bookmark the permalink.